The Kelly Kettle company is located in the West of Ireland, where the Kelly Kettle has been an essential piece of camping kit for Irish Fishermen for many generations. Brothers Patrick & Seamus Kelly, the current Directors of the company are very proud to be the fourth generation of the Kelly family to be associated with their famous Kettle. Like the rest of their family, the brothers are extremely keen outdoor enthusiasts and are accomplished anglers. Both Patrick & Seamus (along with their father Padraic & Grandfather Jim) have fished on the Irish International Trout Fly-fishing team on numerous occasions, and are well know on the Competitive angling circuit in Ireland & the U.K.
Born and raised on the shores of Lough Conn, Co. Mayo, Ireland, Patrick & Seamus quickly developed a love of fishing and in their school years, spent every weekend and the holiday months fishing and acting as guides on Lough Conn and other waters in the West of Ireland. The Kelly Kettle was standard kit on each and every one of these fishing trips! 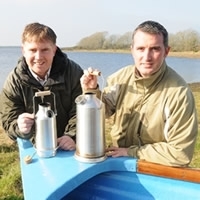 Seamus & Patrick are both Post-Graduates of University College Galway, Ireland and established Management careers in International Marketing & Commercial Banking respectively before returning to take the helm of the Kelly Kettle company in the Summer of 2005. Their experiences have been brought to bear on the business and thanks to their enthusiasm, drive and determination, the popularity of the 'Kelly Kettle' continues to grow every year. Kettles which were once the 'secret weapon' of Irish Anglers are now been used all around the world for car camping, fishing, scouting, kayaking, family picnics and have become an essential item for many peoples Emergency Preparedness, survival or disaster kits. Our Motto is: Everything is possible .... the impossible just takes a little longer!